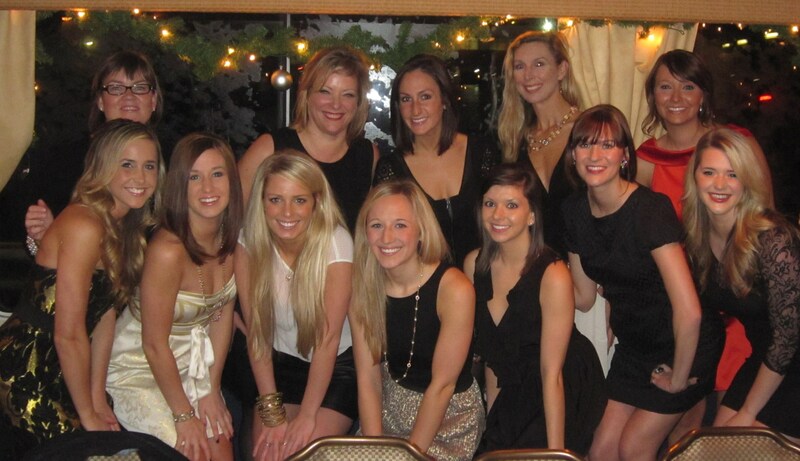 We've done a lot of wacky company parties, being a PR firm and all. Let's see: there was that antique firetruck rental, in which we dressed all in red, "kidnapped" our visiting PR friend Andrew Freeman, swathed him in a red patent firefighter jacket and helmet and howled at passerby from the tops of our lungs in this open seated truck…going point to point to client restaurants. Then there was that one Halloween when we all dressed as Kill Bill charcters, even packin' a ghetto blaster that blared the movie's theme music. The holiday parties have varied from in-home, catered dinner parties with naughty Santa to point-to-point "client crawls" that always had a designated driver (did we delete the photos of Heidi climbing on that grand piano?!). I suppose this year's holiday party was no exception, save for the fact that the "driver" was actually a USCG licensed captain who took us on an incredibly elegant Waterways cruise around Lake Union on the yacht Destiny. Lights twinkled, servers dashed about, a bartender charmed and we all dined like royalty on a perfectly prepared four-course meal (short ribs, woot!). Oh yes we drank, some in moderation (ahem!). Seeing Eastlake, and Queen Anne, and SLU from the water was like traveling to a new land. You see how it all connects. I would recommend this to anyone over the standard cruises you find in Seattle. The crew has it down. We are grateful for an amazing, elegant and memorable party for 2010. We'll mark it as our best yet.